Explanation: They may look like round rocks, but they're alive. Moreover, they are modern versions of one of the oldest known forms of life: stromatolites. Fossils indicate that stromatolites appeared on Earth about 3.7 billion years ago -- even before many of the familiar stars in the modern night sky were formed. 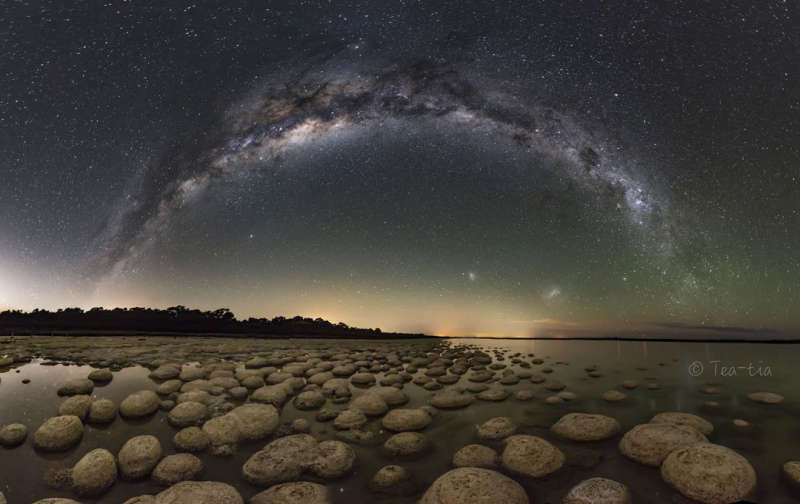 In the featured image taken in Western Australia, only the ancient central arch of our Milky Way Galaxy formed earlier. Even the Magellanic Clouds, satellite galaxies of our Milky Way and visible in the featured image below the Milky Way's arch, didn't exist in their current form when stromatolites first grew on Earth. Stromatolites are accreting biofilms of billions of microorganisms that can slowly move toward light. Using this light to liberate oxygen into the air, ancient stromatolites helped make Earth hospitable to other life forms including, eventually, humans.